brent Archives - Kase and Company, Inc.
WTI crude oil’s decline wiped out yesterday’s bullish morning star setup and fulfilled the $61.5 larger than (1.618) target of the wave $66.66 – 63.67 – 66.3. If the move down from $66.66 proves to be a three-wave correction the $61.25 swing low should hold. However, as of this afternoon, there is no definitive evidence this will be the case (though an upward correction might take place first as discussed below). Odds favor a continued decline and a close below $61.2 will open the way for $60.8, $60.2, and $59.3. The next major objective is $58.0, the trend terminus and XC (2.764) projection of the aforementioned wave down from $66.66. That said, there is a reasonable chance the move down from $66.66 will transmute into a five-wave formation that just completed Wave III at $61.25. If this is the case, then an upward correction to form Wave IV should take place first. Today’s $62.9 midpoint is expected to hold, but the key level is today’s $63.9 open. A close over this would be an early indication that the corrective move down may be complete. Brent crude oil fulfilled the $65.2 larger than (1.618) target of the wave $70.78 – 67.81 – 70.02 when prices fell to $65.16 today. This is a potential stalling point, but there is no definitive technical evidence that indicates the move down will stall. If the move down from $70.78 is a three-wave correction of the larger scale move up, then $65.16 should hold. However, this is doubtful because Brent has settled below the $65.6 smaller than (0.618) target of the sub-wave $70.02 – 66.53 – 67.72. This means that this wave should extend to at least its $64.2 equal to target. A close below $64.9 would open the way for $64.2, which then connects to $63.0 and $62.0. The $62.0 target is the next major objective because it is the trend terminus and XC (2.764) projection of the wave down from $70.78 and the larger than target of the wave down from $70.02. With all of that said, there is a chance the wave down from $70.78 is Wave I of a five-wave pattern that completed Wave III at $65.16. 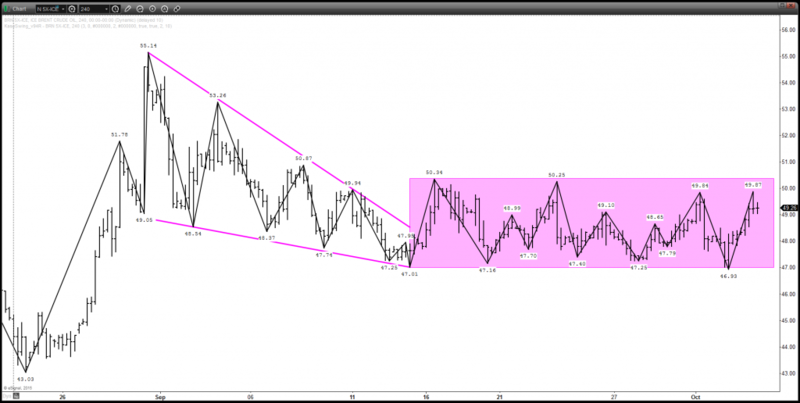 In this case, an upward correction to form Wave IV should take place first. Today’s $66.4 midpoint is expected to hold upon such a correction. Key resistance is today’s $67.2 open. This is a brief analysis for the next day or so. Our weekly Crude Oil Commentary and daily updates are much more detailed and thorough energy price forecasts that cover WTI, Brent, RBOB Gasoline, Diesel, and spreads. If you are interested in learning more, please sign up for a complimentary four-week trial. The U.S. rig count rose by 17 last week, and according to the EIA, U.S. crude oil supplies have reached 490.7 million barrels, the highest reported level for this time of year since 1930. In addition, the U.S.’s repeal of the 40-year oil export ban could ultimately encourage more pumping from domestic crude oil producers and narrow the WTI-Brent spread closer to parity in coming weeks. This is possibly good news for domestic producers, though it will take months and perhaps years before we will truly know. Overall, it is being reported that these factors could prolong the supply glut that is projected to last through the end of 2016 and possibly beyond. The narrowing WTI-Brent spread is a being driven by WTI’s deeper contango versus Brent. In January 2015, the two grades were trading near parity, and it looks like this will be the case again in early 2016. This is encouraging for some U.S. producers as the spread could extend into positive territory where $2.60 is a confluent projection. However, longer-term, a narrow spread would likely lead to increased U.S. production, which would be negative for WTI. Conversely, a positive spread could encourage Brent producers to cutback, thus spurring both grades higher over the course of the longer-term. The key will be seeing whether or not the spread becomes positive and remains that way for the next few months. If so, it could lead to a longer-term shift in production strategies, and ultimately prices, world-wide. Another factor to watch right now is the calendar spreads and the cost of carry. The six-month average cost of carry narrowed a bit for WTI and Brent last week, but remains volatile. Typically, a carry above approximately ($0.50) encourages those with storage to buy oil now, store it, and then sell it at a later date when prices are higher (due to deep contango). This is fundamentally negative because supply rises. The six-month average costs of carry for WTI was ($0.93) and for Brent ($0.79) as of Friday’s settlement. The technical agree with the negative fundamental and spread factors right now. Most momentum indicators are oversold and setup for divergence on the weekly and daily charts. Therefore, a correction might take place soon. However, until a swing low in both price and momentum are made look for the decline to continue. Over the next day or so we expect WTI to fall to $35.0 and for Brent to challenge $35.6. Both are crucial targets to connect to much lower levels as discussed in our full weekly analysis. This is a brief analysis and outlook for the next day or so. 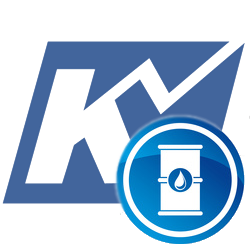 Our weekly Crude Oil Commentary is a much more detailed and thorough energy price forecast. If you are interested in learning more, please sign up for a complimentary four-week trial. For the past few weeks each bit of positive crude oil news or fundamental data has seemingly been offset by something negative. As a result, November Brent has settled into a rectangle formation with boundaries between $47.0 and $50.3. The upper boundary of the rectangle is poised to be challenged after Monday’s move up to $49.87. The pullback at the end of the day indicates another oscillation lower might take place first, but for now, odds still favor a break higher. A close over $50.3 would call for at least $51.7. 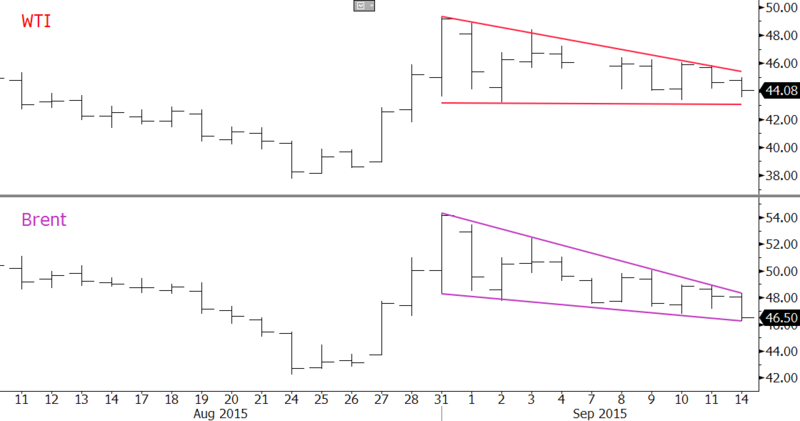 Conversely, Brent’s move up has already failed once after breaking higher out of a bullish pennant on September 15. Since then the rectangle has formed. Should the rectangle fail, and prices close below $47.0, look for at least $45.3. This is a brief analysis and outlook for the next day or so. Our weekly Crude Oil Commentary is a much more detailed and thorough energy price forecast. If you are interested, please sign up for a complimentary four week trial. Last week we stated WTI and Brent would likely settled into trading ranges while sorting out longer-term fundamental factors and the late August price surge. That has been the case, and so far the oscillations have formed a flat descending triangle for WTI and a pennant for Brent. Both patterns are bullish, but have a higher than normal probability to fail in our opinion. Even upon a break higher we do not expect a bullish rally to ensue, but rather a test of the recent swing highs. 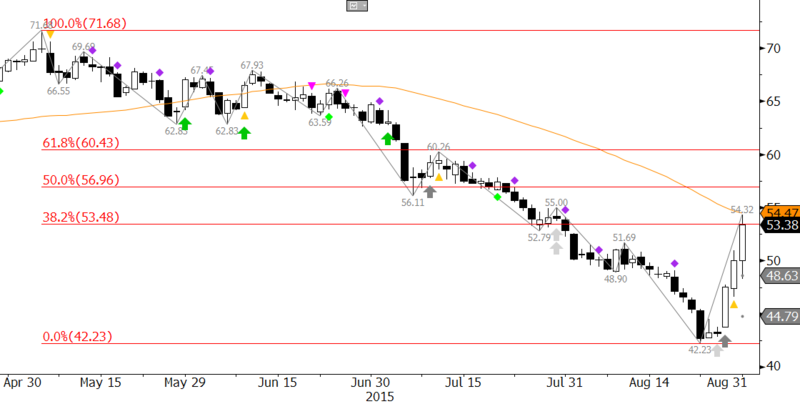 Should the patterns fail look for major support at $42.6 for WTI and $46.7 for Brent. In other words, we think the trading range will continue to form between approximately $42.6 and $49.0 for WTI and $46.7 and $52.0 for Brent. Many market participants are skeptical of Brent’s meteoric rise over the past three days. However, there is no denying the positive technical factors that indicate a bottom has likely been made. The monthly morning star setup and hammer, weekly bullish engulfing line, and daily three white soldiers candlestick patterns are reliable reversal patterns. KaseX also triggered reversal signals (gray arrows) early last week. Brent is on the teetering edge of confirming a sustained bullish outlook and has risen to the 50-day moving average at $54.47, the 38 percent retracement from $71.68, and the upper standard deviation band. A close over $54.5 will confirm a positive outlook and call for $55.4 and higher. That said, because of the confluence of technical resistance at $54.5 this is a very likely stalling point. We expect a test of support at $51.9 within the next few days and likely before Brent closes over $54.5. A close below $51.9 would call for $50.6 and $49.7. The latter must hold for the near-term outlook to remain positive. This is a brief Brent oil forecast and outlook for the near-term. Our weekly Crude Oil Commentary is a much more detailed and thorough energy price forecast. If you are interested, please sign up for a complimentary four week trial.